The gym which helps you reach your fitness potential. We offer an individualised approach to helping you achieve your health and fitness goals. Whether you want to get fit, lose weight, or gain strength, our qualified trainers will work with you and provide you with on-going support. We offer competitive packages including one free personal training session when you sign up to flexis or memberships three months or longer. The perfect way to get started and know you're going to be on the right track to achieving your fitness goals. When you sign up to a one month flexi or membership three months or longer, you will receive one free personal training session. In this session you will work with one of our qualified trainers who will create a personalised programme based on your goals and needs. Our Personal Trainers offer a variety training packages for new and existing members. At Shoreline Fitness we have a range of Group Exercise Classes running throughout the week. Our classes cater to all fitness levels, age groups and fitness goals. With various ways to burn fat, increase muscle tone, gain strength, improve coordination and increase fitness. You're guaranteed to achieve, and have fun doing doing so. We have a range of nutrition products available for purchase at the gym, or online. 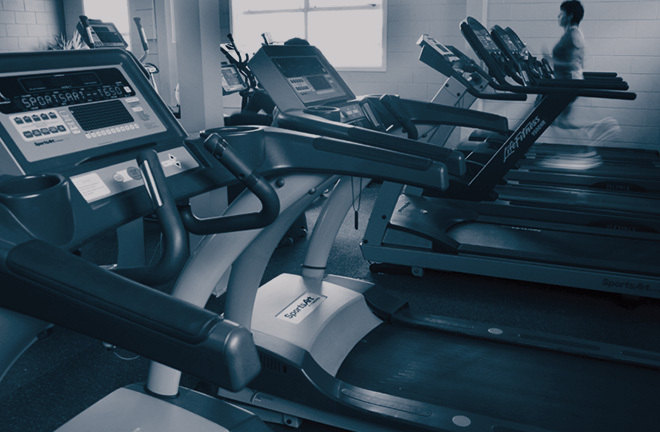 With a large range of equipment we have a facilities to help you achieve your fitness goals, regardless of what they may be. Weights room: We have a large weights room, incorporating both machines and free weights. We have everything you need to help build muscle, tone up and get you on your way to a healthier lifestyle. Cardio room: If your goals are based more around fitness and cardiovascular fitness you are sure to get those results using the top of the line cardio equipment we have available.